If you’re an established non-profit organisation, you’ll probably have already followed this step. I’ve created a simple demo site to demonstrate the techniques from this post, so you can check that to see what I’ve done. Now you need to add another field, which will be displayed if someone selects that ‘other’ option. Again from the Pricing Fields box, select Product. Edit the new product, including a title and description that will help people understand what this form is for. 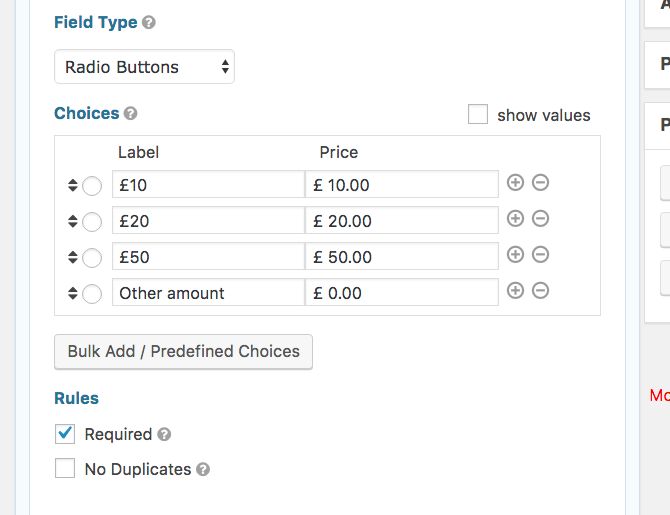 In the Field Type dropdown, select User Defined Price. Now click on the Advanced tab for that field. Check the Enable Conditional Logic checkbox. 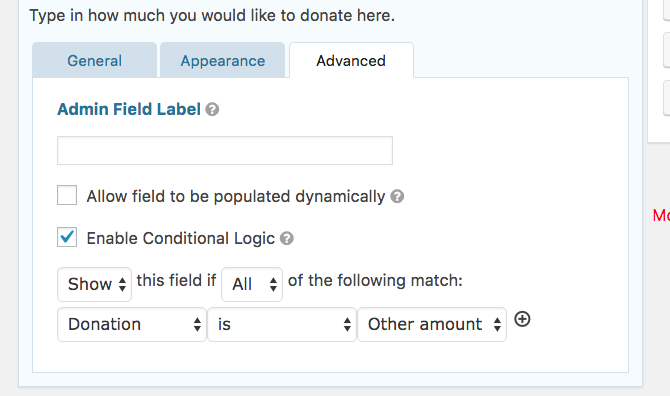 Edit the conditional logic statement to show this field if the previous field (Donation) is Other amount. This means that this field will only appear if someone hasn’t selected one of the predefined amounts in the previous field. Now click the Update Form button to update your form. Our award-winning support team is filled with friendly folks who know their stuff and want to help you out. And since we live all over the world, there’s always someone available, whether it’s over live chat, email or in our forums. Next, create a new page and call it Donation. Do this by going to Pages > Add New in the admin menu. Leave this page blank for now, but add it to your site’s main navigation menu by going to Appearance > Menus or using the Customizer. 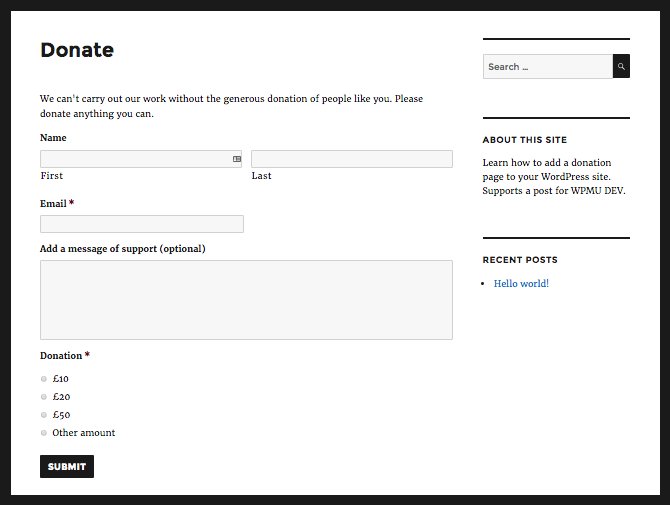 Now it’s time to add the form to the donation page you created. Go to the editing screen for that page by clicking Pages and then selecting it. In the page editing screen, click the Add Form button. Then click the Insert Form button. This will add a shortcode to your page. Don’t edit that. Let’s finish off by making some final tweaks to the form and the page. Start by editing the page. Add anything you can that will encourage people to donate – text, images or video. Make sure it doesn’t push the donation form out of the way, though. Now let’s edit the message someone sees after completing the form. Go back to the form editing screen and click the Settings option at the top. This will open the Form Settings tab. 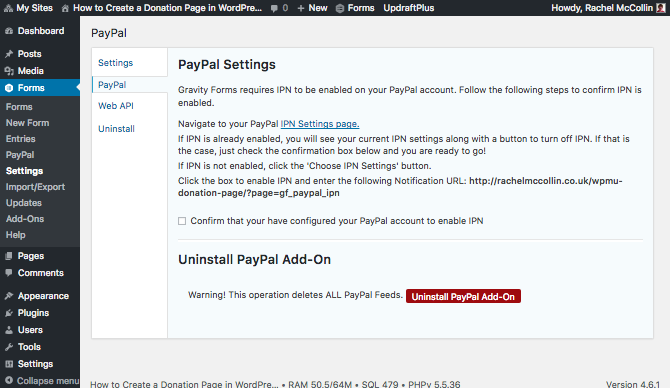 Scroll down and edit the button text for the submit button – I’m changing mine to Donate. Click Update Form Settings to save your changes, then click the the Conformations tab on the left. Select Default Confirmation. Click Save Confirmation to save your changes. Finally, let’s add an email to be sent when someone makes a donation. Click the Notifications tab and click the Add New button. You might want to add a message of thanks and some links to information about the charity’s work, plus links to your social media accounts. Add a name to the Name field that makes sense. In the Send To field, select the Select a Field radio button, then select the Email field. 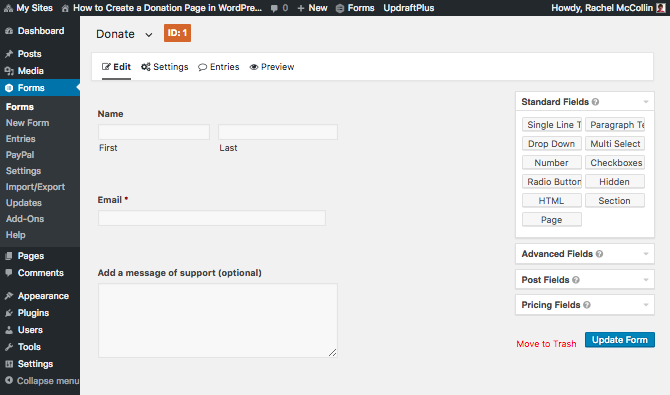 This will make sure the notification goes to the email address the donor has provided. In the From Name field, type the name of your organization. In the From Email field, keep it as the default admin email or add a do not reply email address. Add some text to the Subject field. Add some thank you text, images and links to the Message field. You can add anything here you’d add to a WordPress post. Finally click the Save Notification button to save your changes. 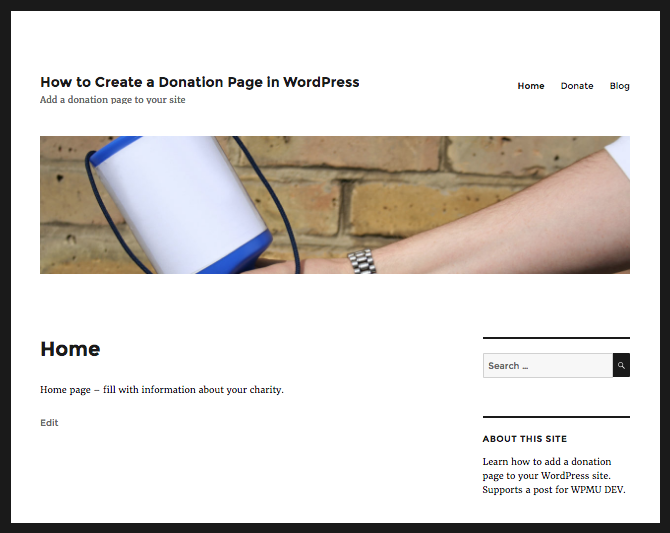 Adding a donation page to your website will give people an easy way to donate money when they’re visiting your site. Make sure you add plenty of links to it from elsewhere in your site, and maybe a nice big button on your home screen. 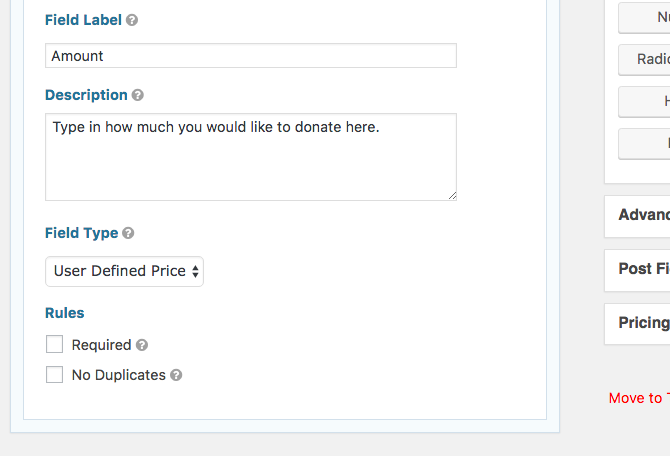 By designing your donation page to encourage people to donate set amounts, you’ll find that you receive more. And by adding extra text and media and sending people a thank you email, you’ll encourage sharing and repeat donations. I hope your donation page makes you lots of money!